Here we take your standard throttle bodies, custom machine them to 48MM, and fit them with the requisite throttle plates. We then perform our masterful in-house port and polish to the entire length of the throttle bodies for a high-velocity perfect finish. Our modified throttle bodies can even out perform the Sport Evo throttle bodies because of our precision port and polish work. If you have heads and cam work, your engine will directly benefit from this breathing improvement. Ideal for heavily tuned street and racing engines. 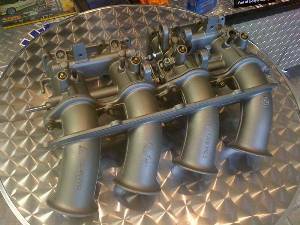 VAC - S14, 50mm Ported Throttle Bodies – WOW, 50mm for maximum high RPM power!